Bob is a friendly and tender hearted being, he also is completely obedient to the person he calls 'boss' which always is a very dominant and/or very charismatic person. Bob is also very dumb, as in incredibly dumb, it is a wonder that he has the mental capacity to breathe. Bob also knows no fear, except fear for the darkness, all other kinds of fear are too complex for Bob's primitive brain. Bob was captured during a police raid on the headquarters of the gangster group. The police found the place completely empty due to an early warning system of the gangsters that tripped the alarm, the only living being still in the compound was Bob. Why Bob? Because Bob was too dumb to try to escape. He is also too dumb to understand what the REKT program is. Doing everything that his boss asked of him and having "Boss" tell him that he did a good Job. The only dream of Bob is to please his boss. However when Bob was still Joachim he wanted to be a programmer and work at a gAIa (global Artificial Intelligence agency) to help program and regulate AI's. Personality development will mostly depend on the interactions with the person he will see as his "boss", if he gets treated well he might regain some of his smarts and slowly develop in a likeable person that you are even able to have a friendly conversation with. On the other hand if he gets treated badly he will spiral down and become more aggressive towards people. Bob is dumb, but he is also lovable. Bob will be kind to others even when they are not kind to him (up to a certain level obviously), like a kid that would cry when he accidentally crushed a grasshopper, Bob will cry if he did harm without meaning it. - His dumbness (obviously), this will play a factor in many cases but can be partly lifted because of his obedience to others. - His crippling fear of the dark, if left alone in a dark room he will break down, depending on his mood he might go berserk and attack everything and anyone nearby or he might go sit in a corner and start crying. 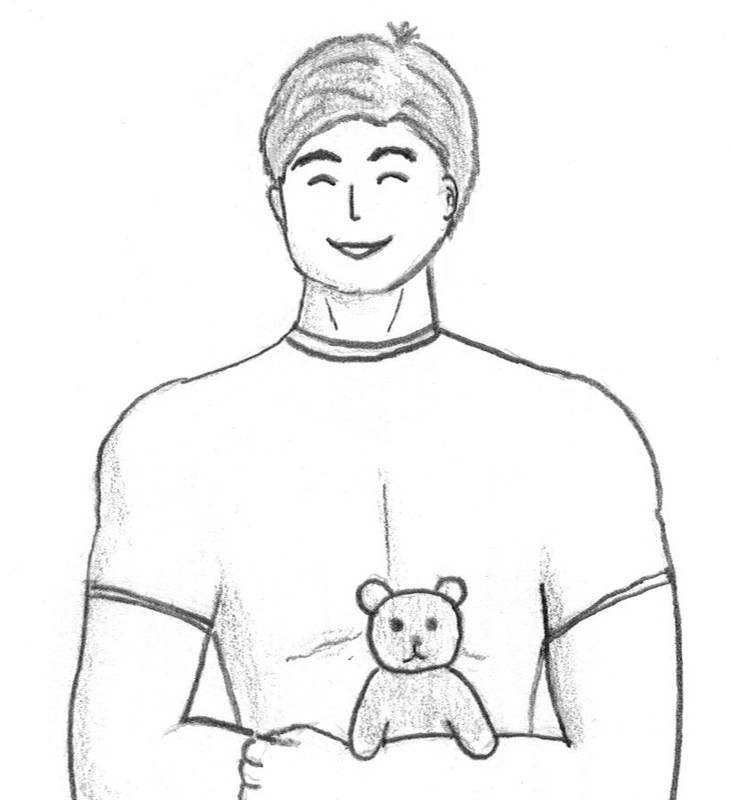 Luckily this only seems to happen when Bob has also lost his teddybear, "Jimmy". - Bob loves to play games, simple games like tag please him the most but he will even try to play complex games even if he fails horribly at them. - Bob loves collecting stuff, it doesn't need to be useful. In his shack at the mafia base bob had a nice collection of junk (coloured glass, rocks, cacti, and some fish in an aquarium) His main collecting interest however appears to be 'shiny' stuff, if it glitters he will take it and keep it. He also has a tendency to be very protective about his "collection" so be warned, don't try to touch his junk. "Get back to work you mindnumbed dumbfuck." said Arn "You don't want me to hit you again." "No please no hit Bob. Bob is good"
"I SAID GET THE frak BACK TO WORK YOU frakking DIPSHIT"
"Leave the man alone Arn"
"But Boris, that frakking dumbass broke a full crate of narcotics, it's going to cost us thousands." "I don't frakking care Arn, that dumbass over there already made us more money than you ever did, if there is someone who should learn his place here, it's you. This was the fourth and last time that I had to tell you this"
"Anyone else who wants to disobey my orders?" "Good" says Boris with a shord nod. "Bob, come here. Did he hit you? Are you OK?" "You save Bob? You good for Bob, you Boss now." "I've always been your boss, Bob" said Boris with a smile. "Now don't make me regret it that I shot Arn OK? Get back to work on stacking those crates." Bob is running, they are behind him, chasing. In his arms he cradles Boris. "Put me down" Boris shouts. Gently Bob puts Boris down in the opening of a door. "Boss? ", he asks confused, "What we do Boss?" "You'll have to leave me here, Bob, I can't go any further. I'm bleeding like a pig and those bastards are right behind us, If I'm going to die anyway then I'd rather die protecting those who protected me." A single tear rolls from Bob's eye. "No Boss, I not leave you"
"GO, You stupid piece of meat!" "No Boss, don't leave Bob alone, Bob wants to be with Boss, Boss is good Boss for Bob." At that moment shouts can be heard from the end of the corridor. "I'm sorry I have to do this" mumbles Boris while he takes his club and flings it at Bob. The club hits Bob right between his eyes. Hurt and sad Bob turns away from Boris, he starts running and while tears trouble his vision, he is able to make it to the dropshop. While Bob takes off, he gets a last glimp of Boris, dead on the cold floor of the corridor with the attackers running around him. This took place a while before Bob got REKT. In the meantime his speech has improved except for moment of emotional stress. Smiling Bob breathes his last breath and with that breath all his memories come flooding back to him. He no longer is Bob the dumbass, he is Joachim the student. A last thought flashess through his mind "Everything is OK in the end." and then darkness washes over Joachim, ending the life of a good man in the wrong situations.